Many swimming pools in Southwest Florida have spas attached that spill water over into the pool under normal filtration but can be isolated in order to heat the spa to a higher temperature (100-104 degrees Fahrenheit) than the pool. If you have manual valves that you must turn in order to heat the spa separately, it can be confusing and even result in limited usage. We specialize in pool automation systems that control all the functions of your pool with the touch of a button on a hand held remote control or a wall mounted control. We even have systems that can be controlled with your smart phone. Installing a pool automation system takes the hassle out of heating up your spa and makes it warm and inviting like it is supposed to be. 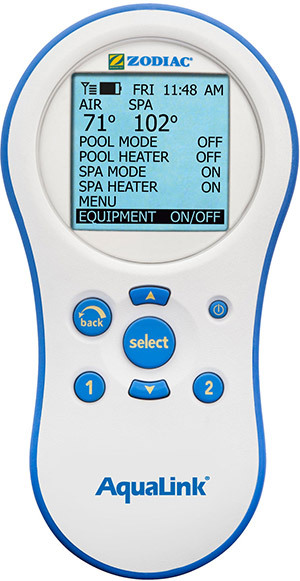 Handheld wireless control for pool automation system. In addition, pool automation will enable you to turn your heater on and off, adjust the temperature of your pool and spa, and turn on auxiliary equipment like a spa blower, pool lighting and salt water chlorine generation systems. Call 239.432.1500 for more information about pool automation systems.